I’ve been thinking a lot about donor segmentation—one of the key (and often missing) factors to successful, ongoing relationships with donors. Segmenting your donors means dividing them into different categories, such as their donation history, age, interests, etc. Admittedly, this requires you to have a pretty good handle on your data. You need to have some confidence that the information in your database is accurate and not riddled with duplicates. But even if your donor date hasn’t been perfect, you can do better moving forward. Referencing your database is the first step. It can tell you how much a donor has given and when. Beyond these numbers, however, how much do you know about them? If you find that their giving history is the limit of your knowledge, ask them to tell you more about themselves. This can be done by including segmentation questions on your online donation form. But be warned! Don’t ask too many questions at once. After all, your primary goal is to get that money. We recommend no more than two segmentation questions as part of your donation form. Another—dare I say a better—tactic is to ask segmenting questions on your Donation Thank-You or Event Registration webpages. At those points, your donor feels great about the commitment they’ve just made and are more likely to continue giving (information). But again, keep it short and sweet! Don’t ask more than four questions at once. Another variation on this theme is to follow a gift with a donor survey. Typically, this approach doesn’t have high completion rate, but could still offer additional insight on donors. Every little bit helps. Offline, you can encourage your development team to fill in the blanks. When they meet new donors or potential donors, they’ll be able to gather some demographic intel that might be useful in future donor communications. Encourage them to add this information to your database. There’s a good chance you’re already doing this. Be sure to show bigger donors a bit more love by inviting them to special events, getting together for one-on-one thank you lunches, and sending personal touches. With smaller donors, nurture them to consider sustaining donations and by sharing the impact of their gifts. Again, you’ve probably already got this information in your database. Did that donor give on a “giving day”? End of year? Every Mother’s Day in memory of her mom? If there’s a pattern to a donor’s giving, use it to your advantage. Try sending your end-of-year donors a summer campaign in addition to sending them your regular holiday communications. Christmas in July, anyone? Asking which of your programs a donor cares about most is a great way to focus your communications for increased retention. Not only does it allow you to better target and hone your messaging for each program, it allows donors to see the impact their donations are making. YMCA of Austin began segmenting their donors by focus area several years ago. 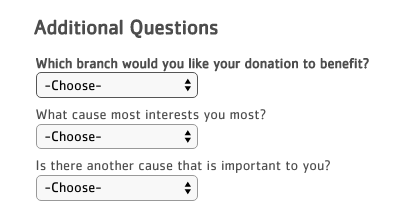 You’ll see their donor segmentation questions on their donation form. Since adding these questions, they’ve honed campaigns specifically for each focus area and have subsequently seen an increase in donor engagement. You’ve probably gone to opt-out of a subscription list and seen the company’s list of interest categories. Unbeknownst to you, you were originally signed up for all of them, but found yourself overwhelmed with the flood of communications coming your way. Instead of automatically signing up your donors for everything, give them options for the types of communications they want to receive—and give them an idea of how often they’ll get these emails. Abila’s Donor Engagement Study finds that donors want to engage differently with the nonprofits they donate to based on their age. For example, older donors want to receive direct mail and newsletters, while younger generations prefer a multi-channel approach that includes peer-to-peer fundraising and radio and TV spots. Communicating with your donors by using their preferred methods not only saves money, but also increases your effectiveness in getting that second, third, or twentieth donation. This chart from the Abila Donor Engagement Study shows that donors want to engage with different media channels based on their age. This one you can do yourself without tapping your donors for insider information. If you’re not already segmenting donors by how they gave, begin today. While currently the number of donors giving online is still relatively small, this method of giving is heavily on the rise (online giving hit 6.7% of donations in 2014, up almost 9% over the previous year). Online giving also lowers your print and postage costs, as you don’t need to send direct mail and letters to a donor who always gives online. Another key consideration is whether donors gave via event participation. Individuals who fundraise through traditional means like walks or runs respond to different forms of communication. They’re used to coaching emails that help them start or lead a team through a fundraising goal and therefore, they’re more likely to connect to someone impacted by the mission of the organization on a personal level (i.e. they know someone with the disease). They will respond to heartwarming stories and results-driven messages. Moreover, they don’t want to continually be asked to give throughout the year because they typically only fundraise for the annual event. Segmenting may sound like it’s going to take up more of your time. And trust me, it will. Therefore, make it an ongoing task in your organization’s annual and long-term planning. But donor segmentation is absolutely worth the effort. You will be able to more personally connect with your donors—talking about things they care most about in the ways and times they prefer. Recent data states that more than 80% of nonprofits are familiar with segmenting and that 64% are currently using it for their communications. If you haven’t started, there’s no time like the present! Start segmenting your donors right here, right now. Take a look at your existing database and see what you’ve got. Determine what is missing and then make a plan for how to gain additional insight into your donors. Use the information that you are able to glean to better communicate and then watch those donations roll in.